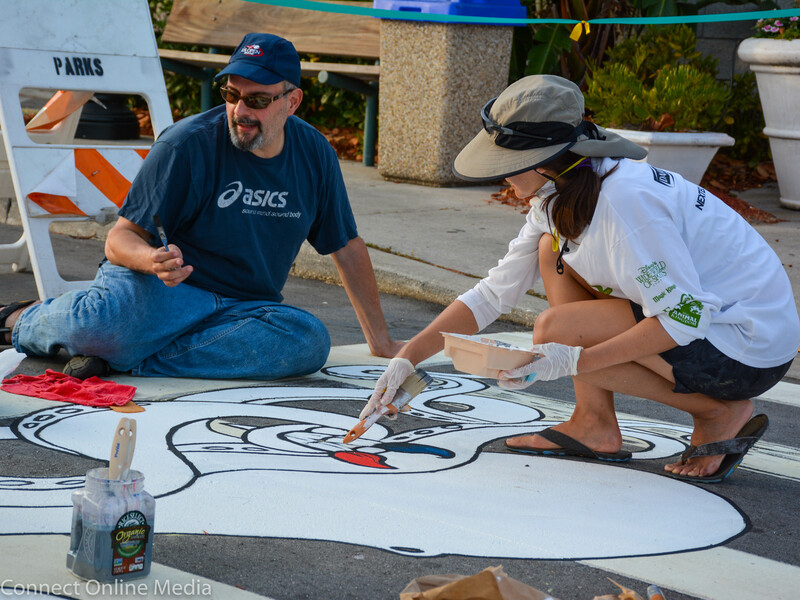 Tampa artist Vanessa Montenegro (l) recently completed the “Renaissance Octopus”, the North Pinellas Cultural Alliance’s first public art installation, at the Safety Harbor Marina. If you’ve taken a trip down to the Safety Harbor waterfront lately, chances are the recently completed boardwalk at the Waterfront Park isn’t the only new thing you’ve noticed. 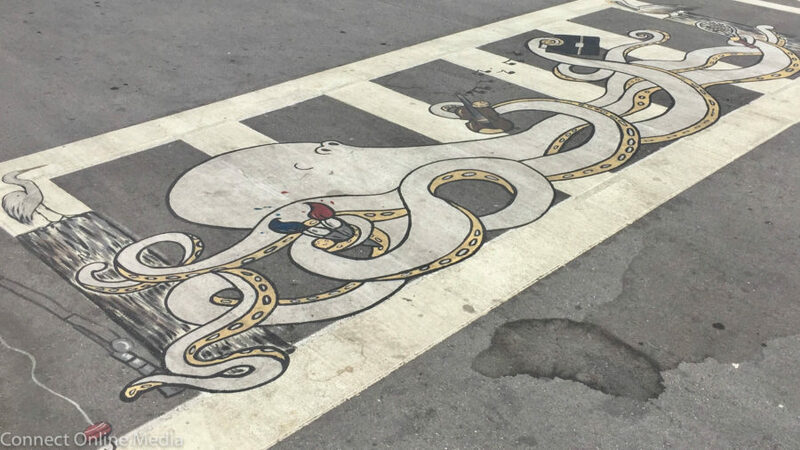 The city recently received its newest public art installation, “Renaissance Octopus”, which was painted on the crosswalk in front of the boat ramp at the Safety Harbor Marina by Tampa artist Vanessa Montenegro. 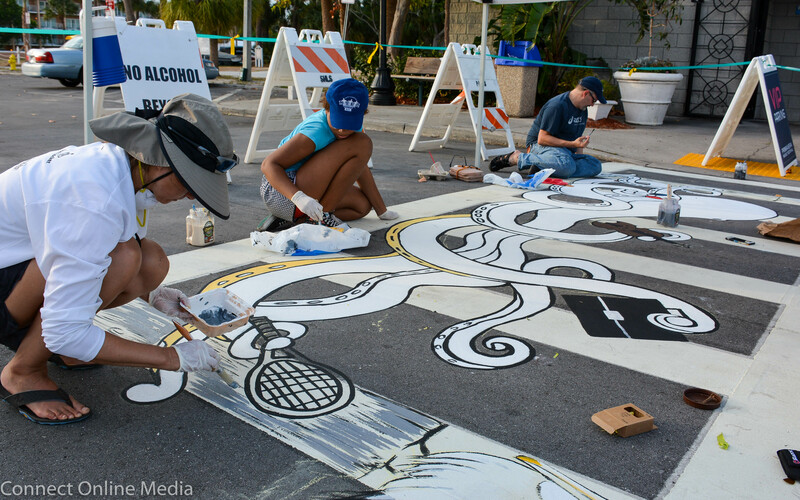 The piece, which features a multitasking octopod embracing sports, art and literature, is the first project for the North Pinellas Cultural Alliance, a nonprofit dedicated to promoting art, culture and history in six north county communities. 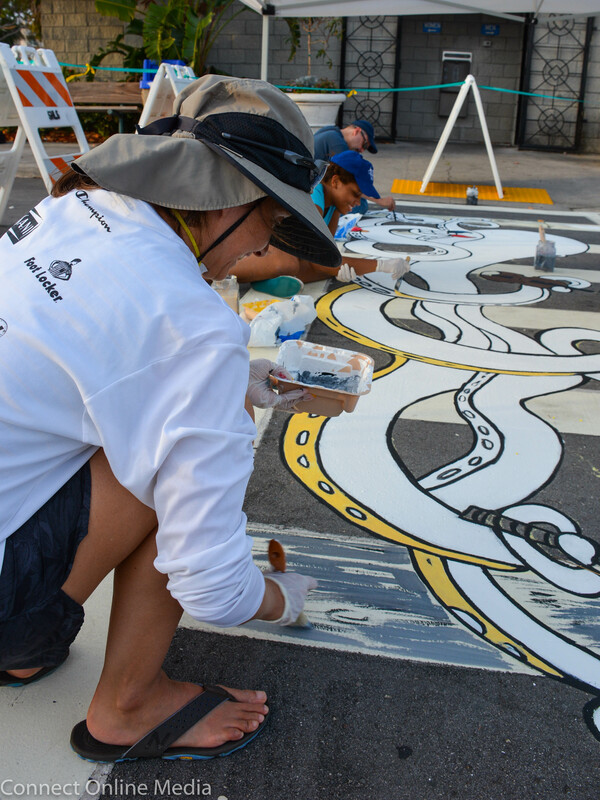 Montenegro, an art teacher who has worked on public art projects in Tampa and Clearwater, said she was happy to be selected for the NPCA’s initial installation as she was finishing up a long day of painting earlier this month. “I love Safety Harbor. 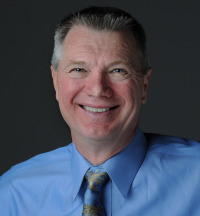 It’s so quaint and cute,” she said on Monday, May 1. 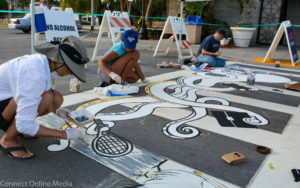 Tampa artist Vanessa Montenegro and her husband, Alfredo, work in Safety Harbor on May 1, 2017. Montenegro said she her team—husband, Alfredo and student Aren Agocho—ran into a few snags when it came to painting the crosswalk, which requires special materials and processes to ensure proper adhesion. “It had to be pressure washed and dried, and we had a couple of technical problems and issues with the wind blowing the stencils around,” she explained. 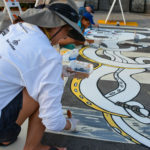 Montenegro, who has worked on the famed Clearwater dolphins as well as a special project for the Southeastern Guide Dogs organization, said her design was chosen by the NPCA after a call for artists went out, and she noted the experience of working with the alliance and the city was a pleasant one. “This was the first one, so we were kind of Guinea pigs,” Montenegro said. NPCA board members and city staff were equally appreciate of Montenegro’s efforts. “Renaissance Octopus” by artist Vanessa Montenegro is a great addition to Safety Harbor’s Public Art collection, and we are grateful for this latest installation,” recreation superintendent and Public Art Committee liaison Shannon Schafer said via email. For her part Zinkel, who acted as a liaison between the alliance and the artist, didn’t want any credit for pulling the project together. “I just want to make sure that North Pinellas Cultural Alliance is thanked for sponsoring the crosswalk, and Vanessa is appreciated for her work,” Zinkel said. N I C E !!! Thank you. 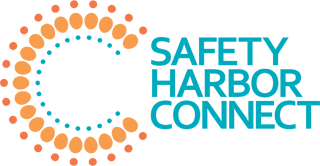 Very special Safety Harbor represents the initial public art project of the NPCA. Thank you all for your time, effort and funds to do the work.